Lee passed away peacefully December 20, 2017 at New Friends in Kalamazoo, MI. He was born August 27, 1921 in Bronson, MI. In 1940 he graduated from Comstock High School, Comstock, MI. Following high school he worked in the Civilian Conservation Corp. He was a veteran of the U.S. Army, serving in WWII in the Military Intelligence Division, War Dept., then as a member of the 3116 Signal Service Battalion. On December 21, 1945 he was united in marriage to Virginia M. Simingtion. 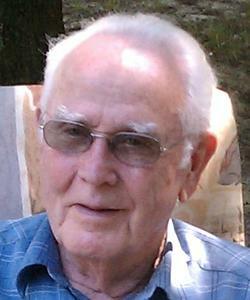 He worked in supervision in the paper industry (Sutherland, Brown Co, James River Corp.) until his retirement. Lee is survived by his daughters: Melody (Dennis) Hopper, Gobles, MI, Sandra (Don) Pennels, The Villages, FL, a son, Dan (Judy) Burch, Ft. Wayne IN, daughter-in-laws Nyda Burch and Kathy Burch, his sister Carolyne Reed, Logan, UT, and many grand, great grand and great-great grandchildren. He was preceded in death by his wife Virginia M. Burch, sons Duane A. and Robert D. Burch, grandson Brent M. Pennels, parents Obert and Norine Burch and brother Duane E. Burch. There will be a private graveside service held at a later date. Donations may be made in memory of Lee to the Hospice Care of Southwest Michigan, 222 N. Kalamazoo Mall #100, Kalamazoo, MI 49007. Arrangements by Betzler Life Story Funeral Homes, 6080 Stadium Drive; Kalamazoo, MI (269) 375-2900.